"We're trapped down here!" IFC Midnight has debuted a short teaser trailer for an indie horror film titled The Autopsy of Jane Doe, a new thriller about morticians who encounter a "Jane Doe" body unlike any other. Emile Hirsch and Brian Cox play father-son coroners who receive a mysterious homicide victim with no apparent cause of death. "Perfectly preserved on the outside, Jane Doe's insides have been scarred, charred and dismembered." As they begin to go to work, they discover "increasingly bizarre clues" that hold the key to her terrifying secrets. This also stars Ophelia Lovibond, Michael McElhatton, Parker Sawyers, and Olwen Kelly. This is from the same Norwegian filmmaker who made Trollhunter. Reviews from Fantastic Fest say it has "endlessly intriguing mystery, great tension". Take a look at the teaser below. Experienced coroner Tommy Tilden and his grown-up son Austin run a family-owned morgue and crematorium in Virginia. When the local Sheriff brings in an emergency case -- an unknown female corpse nicknamed 'Jane Doe', found in the basement of a home where a multiple homicide took place -- it seems like just another open-and-shut case. But as the autopsy proceeds, these seasoned professionals are left reeling as each layer of their inspection brings frightening new revelations. 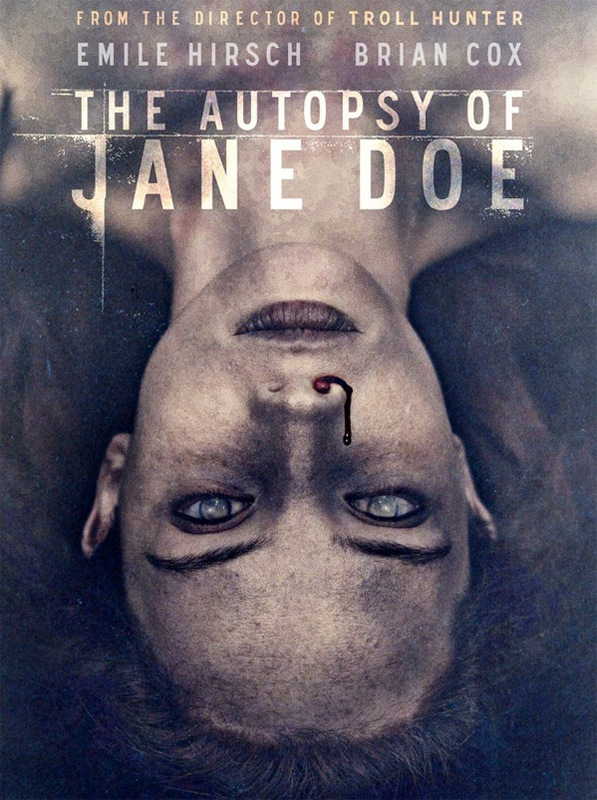 Perfectly preserved on the outside, Jane Doe's insides have been scarred, charred and dismembered -- seemingly the victim of a horrific yet mysterious ritualistic torture. As Tommy and Austin begin to piece together these gruesome discoveries, an unnatural force takes hold of the crematorium. While a violent storm rages above ground, it seems the real horrors lie on the inside… The Autopsy of Jane Doe is the first English-language film from Norwegian filmmaker André Øvredal, of Trollhunter previously. The script is written by Ian B. Goldberg & Richard Naing. This first premiered at TIFF and Fantastic Fest. IFC releases the film on December 21st. Troll hunter was a solid flick. He created a film with a big budget feel without a big budget. I would like to see this. Looks good. I'll watch anything Brian Cox is in. the director of Troll Hunter, Brian Cox, a nice actual *teaser* and lots unexplained, plus i like the bell motif - fersure count me in. Very intriguing. Loved Troll Hunter, love Brian Cox, definitely looking forward to this. Nice to see Hirsch again.